The Contact information page of your account contains your user profile, account and billing contact information, as well as contact information associated with each audience in your account. You can easily access and change that information at any time. In this article, you'll learn about the data stored on this page, and how to view or change it. 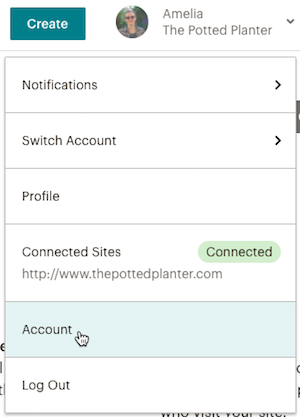 Mailchimp sends certain account notifications, and billing and compliance correspondence to the email addresses stored in these sections of the Contact information page. This section contains your user login information. The email address stored here receives a link if you need to reset your password or username, and notifications when you import or export contacts. The email address stored here receives other communications related to the account, including campaign send, domain verification, and compliance notifications. The email address stored here receives all the billing correspondence for your account, which includes monthly billing statements, Pay As You Go credit alerts, and monthly billing estimates. Each audience in your account can have its own contact information associated with it. Audience information is visible to your subscribed contacts, so make sure you choose an email address and contact information you're comfortable sharing, as that information will be publicized in the required email footer content for that audience. You can view or change your profile, primary account contact, billing or audience information details at any time. To access the Contact information page, follow these steps. 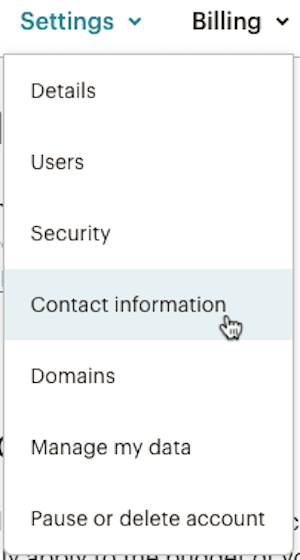 Click Settings in the Account navigation bar and choose Contact information. To make changes, click the edit button under the appropriate section. After you're done, click Update or Save. Mailchimp requires a domain when you create your account. Learn why a domain helps us ensure delivery and get options for registering your own domain. What to do if you suspect your account has been compromised.